Only single-volume edition in print of a lesser-known work by Mark Twain. Will appeal to fans of Mark Twain and Shakespeare alike. Lavishly produced, ideal as a gift. 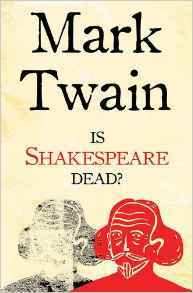 An exponent of the theory that William Shakespeare, the modestly educated provincial man from Stratford-upon-Avon, could not have written the works – full of erudition and accurate professional jargon – which are attributed to him, Mark Twain offers an eloquent and entertaining analysis of this issue of authorship, peppered with personal recollections of his own first encounters with the Bard’s plays, on a boat on the Mississippi. We have all heard of doubts and arguments that William Shakespeare of Stratford-upon-Avon wrote the plays attributed to him, but it was only on reading this book that I realised that those doubts surfaced as far back as the 1850’s. Here we have Mark Twain’s own theories which are well expounded in an eloquent yet easy to read style. Of course, being Mark Twain he has used his trademark humour to illustrate his points. As an entertainment I found it extremely enjoyable but to the literary student who is trying to discover the truth of the matter it is of limited value because in the century since this book’s publication in 1909, there have been several hundred more books on the subject and further possible authors have been suggested including, in 1920, Edward de Vere the 17th Earl of Oxford who would appear to meet Twain’s criteria. Although, Is Shakespeare Dead? is only 88 pages long, Alma Classics have provided good value for money with their usual Extra Material section which includes a biography and bibliography of the author. The volume also includes a short sketch entitled 1601: Conversation, as it was by the Social Fireside, in the time of the Tudors which is a spoof diary entry involving the Queen and leading celebrities of that time including the Bard. Be warned; the subjects discussed in the conversation contain adult humour but I must confess to finding some of it hilarious. Whilst there are now more definitive works on the subject, this book nonetheless entertained and educated me for a few hours so I am pleased to give it a four star rating. Samuel Langhorne Clemens, better known by his pen name Mark Twain, was an American writer, humorist, entrepreneur, publisher, and lecturer. Among his novels are The Adventures of Tom Sawyer, and its sequel, the Adventures of Huckleberry Finn, the latter often called “The Great American Novel”. Twain was raised in Hannibal, Missouri, which later provided the setting for Tom Sawyer and Huckleberry Finn. He served an apprenticeship with a printer and then worked as a typesetter, contributing articles to the newspaper of his older brother Orion Clemens. He later became a riverboat pilot on the Mississippi River before heading west to join Orion in Nevada. He referred humorously to his lack of success at mining, turning to journalism for the Virginia City Territorial Enterprise. His humorous story, “The Celebrated Jumping Frog of Calaveras County”, was published in 1865, based on a story that he heard at Angels Hotel in Angels Camp, California where he had spent some time as a miner. The short story brought international attention and was even translated into classic Greek. His wit and satire, in prose and in speech, earned praise from critics and peers, and he was a friend to presidents, artists, industrialists, and European royalty.